Until recently, the longest back test using stock market data was Geczy and Samonov’s 2012 study of relative strength momentum called “212Years of Price Momentum: The World’s Longest Backtest: 1801-2012”. The length of that study is now exceeded by an 800 year back test of trend following in Greyserman and Kaminski’s new book, Trend Following with Managed Futures: The Search for Crisis Alpha. The authors looked at 84 equities, fixed income, commodities, and currencies markets as they became available from the years 1200 through 2013. They established long or short equal risk sized positions based on whether prices were above or below their rolling 12-month past returns. This is different from absolute momentum in that it uses total rather than excess returns and short as well as long positions. The average annual return of this strategy was 13% with an annual volatility of 11% and a Sharpe ratio of 1.16. In contrast to this, buy-and-hold had a return of 4.8%, volatility of 10.3%, and a Sharpe ratio of 0.47. Worst drawdown for trend following was also lower than for buy-and-hold. Equities alone with trend following showed a higher Sharpe ratio and nearly a 3% greater annual return than with buy-and-hold from 1695 through 2013. But let’s not just look at trend following on its own. Let’s also compare it to other possible risk reducing or return enhancing approaches and see what looks best. We will base our comparisons on the performance of U.S. equities because that is where long-run risk premium and total return have been the highest. We have U.S. stock market data available from the Kenneth French data library all the way back to July 1926. We will first compare trend following in the form of absolute momentum to seasonality and then to the style and factor-based approaches of value, growth, large cap, and small cap. We will also see if it makes sense to combine any of these with trend following. For seasonality, we look at the popular Halloween effect, sometimes called “Sell in May and go away…” Practitioners have known about this for many years. There have also been a handful of academic papers documenting the positive results of holding U.S. stocks only from November through April. 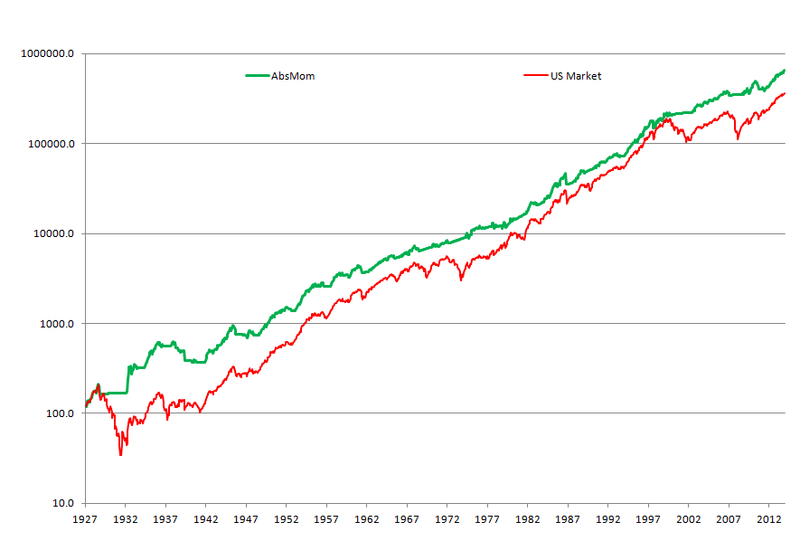 The following table shows the results of this strategy compared with absolute momentum applied to the broad U.S. stock market from May 1927 through December 2014. With 10-month absolute momentum, we are long stocks when the excess return (total return less the Treasury bill rate) over the past 10 months has been positive. Otherwise, we hold Treasury bills. We also hold Treasury bills when we are out of U.S. stocks according to the Halloween effect (in stocks Nov-Apr, out of stocks May-Oct). 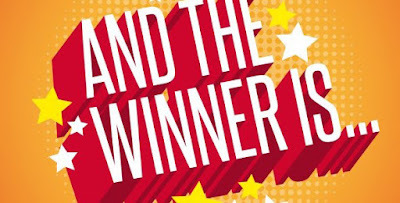 Results are hypothetical, are NOT an indicator of future results and do NOT represent returns that any investor actually attained. Indexes are unmanaged, do not reflect management or trading fees, and one cannot invest directly in an index. Please see our Disclaimer page for more information. We see that the 6-month seasonal filter of U.S. stock market gives reduced volatility and a lower worst drawdown but at the cost of reducing annual returns by over 200 basis points. Trend following absolute momentum, on the other hand, gives a greater reduction in worst drawdown than seasonality with almost no reduction in return. There is little reason to consider seasonal filtering when absolute momentum gives a greater reduction in risk without diminished returns. The table below shows the U.S. market separated into the top and bottom 30% based on book-to-market (value/growth) and market capitalization (small/large). We see that value and small cap stocks have the highest returns but also the highest volatility and largest maximum drawdowns. In every case, adding absolute momentum reduces volatility, increases the Sharpe ratio, and lowers worst drawdown. But the biggest impact of absolute momentum is on large cap stocks. Next best is the broad market index. 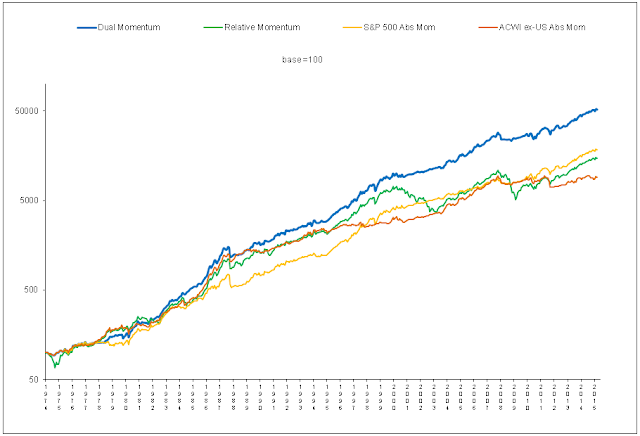 The use of a trend following absolute momentum overlay further reduces the relative appeal of value or small cap stocks. One may wonder why large cap stocks respond better to trend following. 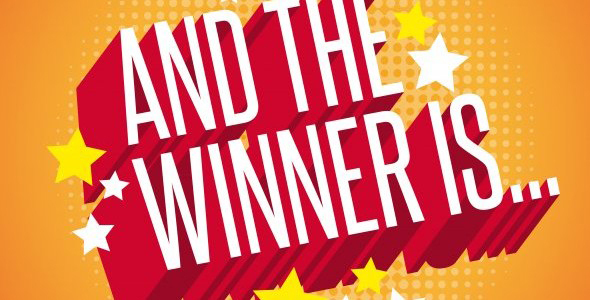 The answer may lie in a study by Lo and MacKinlay (1990) showing that portfolio returns are positively autocorrelated (trend following), and that the returns of large cap stocks usually lead the returns of small cap stocks. Since trend following lags behind turns in the market, investment results should be better if you can reduce that lag by being in the segment of the market that is most responsive to changes in trend. That segment is large cap stocks, notably the S&P 500 index, which leads the rest of the market. 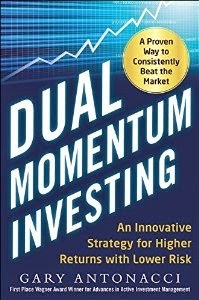 In my book, Dual Momentum Investing: An Innovative Strategy for Higher Returns with Lower Risk, I give readers an easy-to-use strategy incorporating both relative strength momentum to select between U.S. and non-U.S. stocks, and absolute momentum to determine market trend and choose between stocks or bonds. I call this dual momentum model Global Equities Momentum (GEM). And what index is the cornerstone of GEM? It is the S&P 500, the one most responsive to trend following absolute momentum and that gives the best long-run risk-adjusted results. Einstein said you should keep things as simple as possible, but no simpler. One can always create more complicated models or include more investable assets. But as we see here, trend following momentum does just fine when applied to large cap stocks. There is a study showing the effectiveness of absolute momentum back to 1903 by Hurst et al. (2012). We use 10-month absolute momentum instead of the popular 10-month moving average because absolute momentum gives better results and 35% fewer trades, which means fewer false signals and whipsaw trades. See our last blog post, "Absolute Momentum Revisited". The next largest worst drawdown was 64.8 for value and 69.1 for small cap on a month-end basis, which were again the largest ones. Intra-month worst drawdowns would have been even higher. See Israel and Moskowitz (2012). U.S. stock market returns have also led non-U.S. stock market returns. See Rapach, Strauss, and Zhou (2012).